Dramatically reduce stopping distances with upgraded performance discs and pads. Essential when increasing engine BHP! Most of the braking effort comes down to the front of the car. The front brakes therefore take the strain and it is here where we start to improve the performance of the braking system. In essence the bigger the contact surface and the better the grip between the brake pads and the brake disc the quicker the car will stop. Discs - extreme heat is produced under heavy braking. This heat hinders the braking process and needs to be dissipated as quickly as possible. Grooved or cross-drilled discs help with this process, as do ventilated discs that are, in most cases, supplied as standard on newer vehicles. Upgrade Kits - bigger brake kits with bigger discs and larger callipers are available for certain vehicles. Performance calipers can have 4 or even 6 pots - this refers to the pistons that push the brake pads onto the discs. Calipers on these kits are often available in different enamel colours that look fantastic when seen through the open spokes of todays large alloy wheels. The larger the alloys, the bigger the disc you can fit. Pads - upgraded brake pads are also available to suit different styles of driving from everyday to track-day. Advanced pad materials reduce brake dust and increase braking performance. Brake Hoses - these hoses give a firmer feel to the brake pedal and therefore better braking. Available in sets for virtually every make and model of vehicle. Carnoisseur have a full range of E-Tech Brakes. To view the E-Tech Brakes we offer simply make your selection below. 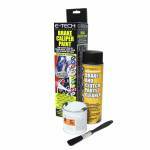 You can purchase E-Tech Brakes on-line or through our network of Carnoisseur Outlets. To find out more about Brakes click here to view our Carnoisseur Brakes Guide.